Connect wirelessly via dual-band Wi-Fi connectivity or Bluetooth 4.0, as well as wired via an asynchronous USB Connection, digital (TOSLINK) input, or an RCA analog input. The LS50W uses a 5.25" Uni-Q driver capable of reaching down to 40Hz, combined with a built-in 192Khz/24bit DAC and 230W amplifier. Choose from Titanium Gray/Red, Gloss Black/Blue, or Gloss White/Copper for your LS50W. Rank: #12 out of 124. Kef LS50 are a very popular and one of the most expensive options. 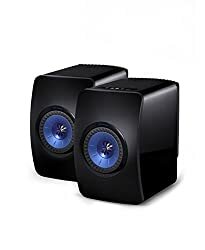 They're in the top 3 bestselling speakers and have dozens of popular alternatives in the same price range, such as Kef R300 or KEF LS50 Mini Monitor . Kef LS50 are $2000 more expensive than average speakers ($199.99).